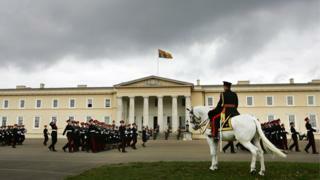 Sandhurst's sheikhs: Why do so many Gulf royals receive military training in the UK? Generations of foreign royals - particularly from the Middle East - have learned to be military leaders at the UK's Sandhurst officer training academy. But is that still a good idea, asks Matthew Teller. Four reigning Arab monarchs are graduates of Sandhurst and its affiliated colleges - King Abdullah of Jordan, King Hamad of Bahrain, Sheikh Tamim, Emir of Qatar, and Sultan Qaboos of Oman. Past monarchs include Sheikh Saad, Emir of Kuwait, and Sheikh Hamad, Emir of Qatar. Sandhurst's links have continued from the time when Britain was the major colonial power in the Gulf. "One thing the British were excellent at was consolidating their rule through spectacle," says Habiba Hamid, former foreign policy strategist to the rulers of Dubai and Abu Dhabi. "Pomp, ceremony, displays of military might, shock and awe - they all originate from the British military relationship." It's a place where future leaders get to know each other, says Michael Stephens, deputy director of the Royal United Services Institute, Qatar. And Sandhurst gives the UK influence in the Gulf. "The [UK] gets the kind of attention from Gulf policy elites that countries of our size, like France and others, don't get. It gives us the ability to punch above our weight. "You have people who've spent time in Britain, they have… connections to their mates, their teachers. Familiarity in politics is very beneficial in the Gulf context." "For British people who are drifting around the world, as I did as a soldier," says Brigadier Peter Sincock, former defence attache to Saudi Arabia, "you find people who were at Sandhurst and you have an immediate rapport. I think that's very helpful, for example, in the field of military sales." Emotion doesn't always deliver. In 2013, despite the personal intervention of David Cameron, the UAE decided against buying the UK's Typhoon fighter jets. But elsewhere fellow feeling is paying dividends. "The Gulf monarchies have become important sources of capital," says Jane Kinninmont, deputy head of the Middle East/North Africa programme at the foreign affairs think tank Chatham House. "So you see the tallest building in London being financed by the Qataris, you see UK infrastructure and oilfield development being financed by the UAE. There's a desire - it can even seem like a desperation - to keep them onside for trade reasons." British policy in the Gulf is primarily "mercantile", says Dr Kristian Coates Ulrichsen, of the Baker Institute in Houston, Texas. Concerns over human rights and reform are secondary. In 2012 Sandhurst accepted a £15m donation from the UAE for a new accommodation block, named the Zayed Building after that country's founding ruler. In March 2013, Sandhurst's Mons Hall - a sports centre - was reopened as the King Hamad Hall, following a £3m donation from the monarch of Bahrain, who was educated at one of Sandhurst's affiliated colleges. The renaming proved controversial, partly because of the perceived slight towards the 1,600 British casualties at the Battle of Mons in August 1914 - and partly because of how Hamad and his government have dealt with political protest in Bahrain over the last three years. A critic might note that the third term of Sandhurst's Officer Commissioning Course covers counter-insurgency techniques and ways to manage public disorder. Since tension between Bahrain's majority Shia population and minority Sunni ruling elite boiled over in 2011, more than 80 civilians have died at the hands of the security forces, according to opposition estimates, though the government disputes the figures. Thirteen police officers have also lost their lives in the clashes. "The king has always felt that Sandhurst was a great place," says Sincock, chairman of the Bahrain Society, which promotes friendship between the UK and Bahrain. "Something like 20 of his immediate family have been there as cadets. He didn't really understand why there was such an outcry." Crispin Black, a Sandhurst graduate and former instructor, says the academy should not have taken the money. "Everywhere you look there's a memorial to something, a building or a plaque that serves as a touchstone that takes you right to the heart of British military history. Calling this hall 'King Hamad Hall' ain't gonna do that." Sandhurst gave a written response to the criticism. "All donations to Sandhurst are in compliance with the UK's domestic and international legal obligations and our values as a nation. Over the years donations like this have saved the UK taxpayer a considerable amount of money." But what happens when Sandhurst's friends become enemies? In 2001, then-prime minister Tony Blair visited Damascus, marking a warming of relations between the UK and Syria. Shortly after, in 2003, Sandhurst was training officers from the Syrian armed forces. Now, of course, Syria is an international pariah. Journalist Michael Cockerell has written about Libyan dictator Colonel Gaddafi's time at the Army School of Education in Beaconsfield in 1966: "Three years [later], Gaddafi followed a tradition of foreign officers trained by the British Army. He made use of his newfound knowledge to seize political power in his own country." That tradition persists. In the 1990s Egyptian colonel Ahmed Ali attended Sandhurst. In 2013 he was one of the key figures in the Egyptian military's removal of Islamist President Mohammed Morsi, now rewarded by a post in President Sisi's inner circle of advisers. In the late 1990s there were moves by the British government under Tony Blair to end Sandhurst's training of overseas cadets. Major-General Arthur Denaro, Middle East adviser to the defence secretary and commandant at Sandhurst in the late 1990s, describes the idea as part of the "ethical foreign policy" advocated by the late Robin Cook, then-foreign secretary. "Coming to that funeral were the heads of state of almost every country in the world - and our prime minister was there, Tony Blair," says Major-General Denaro. "He happened to see me talking to heads of state - the Sultan of Brunei, the Sultan of Oman, the Bahrainis, the Saudis - and he said 'How do you know all these guys?' The answer was because they went to Sandhurst." "In the future," says Maryam al-Khawaja, acting president of the Bahrain Centre for Human Rights, "people will look back at how much Britain messed up in the [Middle East] because they wanted to sell more Typhoon jets to Bahrain, rather than stand behind the values of human rights and democracy." "It's one thing saying we're inculcating benign values, but that's not happening," says Habiba Hamid. Sandhurst is "a relic of the colonial past. They're not [teaching] the civic values we ought to find in democratically elected leaders." Who else went to Sandhurst? Sandhurst says that "building international relations through military exchanges and education is a key pillar of the UK's international engagement strategy".